Last few days I have been sandboxing with this latest ‘Facebook killer’ released by Google. It is a widely known fact that Google is having serious perceptional barriers to overcome at the launch of Google +, due to the blunders, they made in their previous attempts to tap into the social frontier (in other words ‘to kill Facebook’). Everybody knows what happened to Google Wave, and nobody cares what actually is happening with Google Buzz. 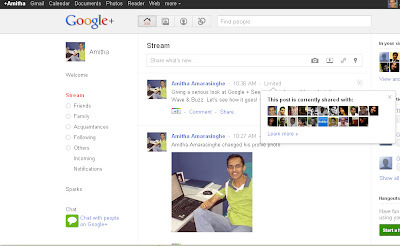 So, what’s the big deal with Google +? 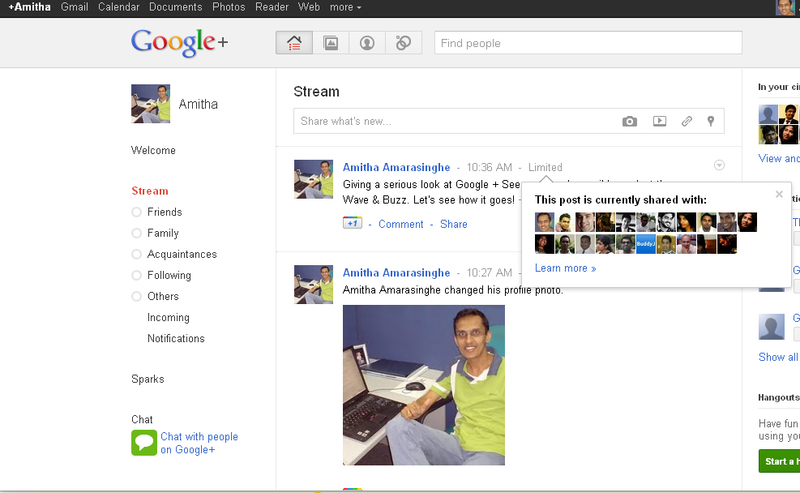 Besides my negative prejudices about Google’s ability to conquer the ‘social frontier’, I was pleasantly surprised when I spent few hours playing around with the new Google + interface. One of the coolest features on Google + is their flagship feature “Circles”. One might argue, this is the same feature as “friends lists” on Facebook, but Google + Circles keep you in better control in managing different social circles you are a part of. Where did Google + Circles come from? 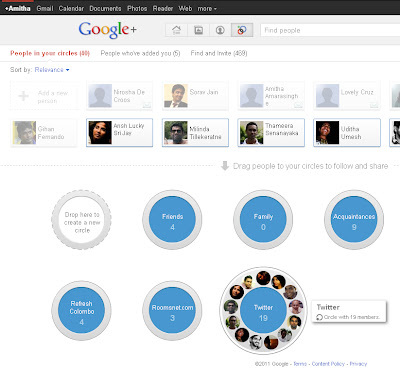 The whole idea behind Google + Circles, links back to the ideas of ‘social graph’ and ‘social clusters’. The social graph of a person, describe how he/she is related to the other human beings on earth, and how they acquired those relationships. 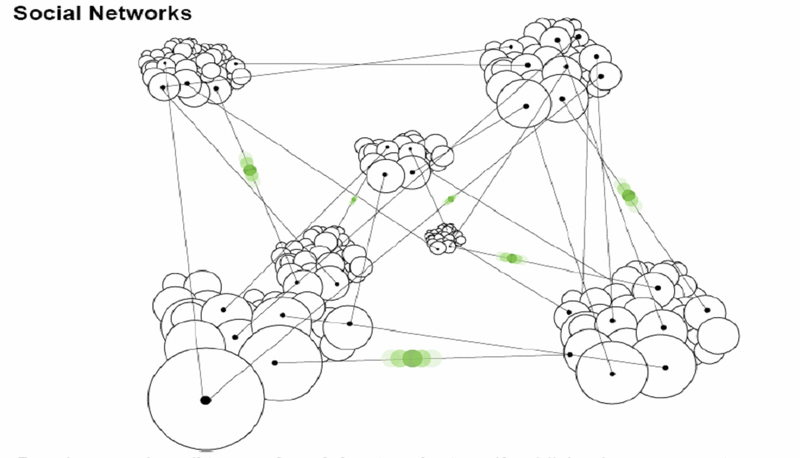 Your social graph is a collection of ‘social clusters linked to each other by what it called a ‘weak tie’. A weak tie is a common member of two or more social clusters, who can bring them together at anytime. These weak ties act as a message carriers in between two or more social clusters, that they are a member. The natural tendency is, we are reluctant to share the same information within all types of social clusters we are a member of, due to various reasons such as fear of being rejected. Take an example, where a well reputed doctor in a government hospital, who is also a great fan of rock music and baseball. This person is part of three different social clusters in this scenario. The co-workers at the hospital, friends & acquaintances he acquired by attending rock concerts, the regular bunch of baseball fans he hangout during his off time. The likelihood of this doctor discussing baseball or rock music during his work shift is less, because he fears being rejected among his work colleagues, who might dislike baseball or rock music. This is the reason why, despite the theory of “six degrees of separation”, it is very much impossible to communicate a message to the entire 6 billion humans on this earth, with only word of mouth alone. Naturally, people like to keep their social clusters apart from each other. I don’t want to share everything that I share with my real life friends, with distant acquaintances I acquired through Twitter or other kinds of social engagements. I don’t like to share my political opinions with the people whom I work with, but I like to enter into a deeply engaging discussion about politics with my close circle of friends. But, how can I do this? Before Google +, I used Facebook entirely for keeping in touch with my real world friends. I usually ‘think more than twice’, before I click on “accept” button on a Facebook friend request. If I have never met a person in my real life, or never even encountered a phone call with them, 99% of the time I will not accept a Facebook request from them. But that doesn’t mean they are bad people with whom I don’t want to associate! (It’s perfectly ok to turn down a FB friend request). That’s where Twitter comes handy. I use, Twitter to be in touch with all the distant acquaintances I acquire in my social encounters, but who are not close enough to share my political opinion or the latest photos from my family trips. Then there is LinkedIn, which I use solely for managing the professional relationships. The question is, how practical is it for someone to actively and personally maintain three or more profiles for managing social relationships? How about the real life friends, you met at school and at work? Is it always the same things you discuss with these two different social clusters? I guess no. This is where Google + Circles make perfect sense. Circles allow you to add your contacts to different social circles, and manage them as entirely different social networks. If you don’t want to discuss your political opinion with your work colleagues, all you have to do is limiting your post to “friends” circle or a custom circle you create for “politics”. Easily drag and drop your friends to any of these circles. You can create custom circles as well. This feature is already available on Facebook, as ‘Friend lists’ but it is a tedious process for figuring out how to use friends list. Google + Circles on the other hand, is very east to navigate and understand. It’s drag and drop interface makes it more easier to create different circles. Once you finish adding your contacts to different circles, Google + will create a visual representation of your social graph. Where did you acquired your closest relationships, and who are the weak ties in between these circles. And what’s more? When everyone finishes drawing their social graphs on Google +, it will be a wealth of information for marketers/politicians. Google + will become a road map for marketers/politicians, to plan their campaigns for influencing the purchase/voting decisions we make, by controlling the ‘social norm’ as in the theory of reasoned action. Makes perfect sense, isn’t it? nice article! specially, like the part where you say that "This feature is already available on Facebook, as ‘Friend lists’ but it is a tedious process for figuring out how to use friends list. Google + Circles on the other hand, is very east to navigate and understand. It’s drag and drop interface makes it more easier to create different circles. " Good study. But I don't think Google+ is a "Facebook killer". I believe they are not in the same lane although they go the same direction, there are - not so - tiny differences that will make Facebook and Google+ to co-exist. The other thing FB will do what they have done with out any effort , some features alraedy in FB, so why i bother about Google.